"The earliest version of this cocktail was simply water, sugar, bitters, and booze. Over time, the water became ice, the booze became whiskey, and the drink became an old fashioned." Muddle sugar cube, water, and bitters in an old fashioned glass for 1 minute. Pour in whiskey and stir for an additional minute. Squeeze the lemon twist over the glass and drop it in. Add ice cubes. 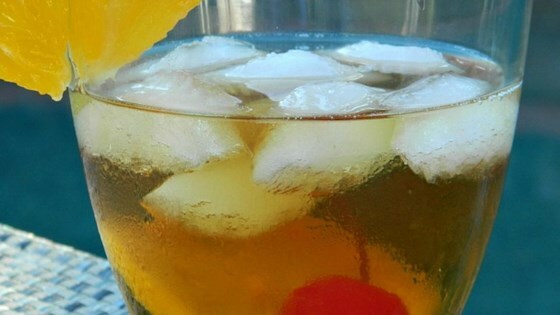 Garnish with a slice of orange and a maraschino cherry; serve with a swizzle stick. See how to make a classic rye whiskey cocktail. I don't have sugar cubes, so I had to wing the amount of sugar to muddle with the bitters. I used Jack Daniel's, and this made my husband very happy! Thanks! I love a good cocktail. Next to a well made Manhattan you can't beat this. Very good. Can also substitute simple syrup for sugar cube and water. I’ve gained ten pounds because of my beloved whiskey sours. I’ve switched to this to save calories. Delicious! I tried this with Woodford Reserve Bourbon. I added a dash of Grand Marnier and a dash of sour mix. I loved it!